Successfully Added Directors Edition Digital Alarm Clock to your Shopping Cart. And Cut! 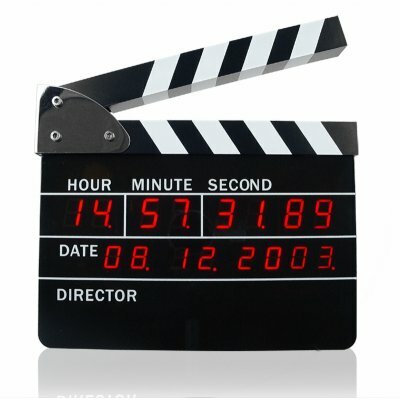 For all you aspiring directors, movie freaks, and people just interested in funky looking clocks, Chinavasion presents this director's clapper-board shaped alarm clock. Looking and acting exactly like a director digital slate, this cool looking desktop accessory displays the date, and the time all the way down to deci-seconds. Set the alarm to anytime you want, and when it rings, just like a director, use the clapper and clip the board just like you are beginning a film take, and the alarm stop (and action!). A cool gadget, great to give as a gift or to feature on your internet storefront to resell to others. In stock for single piece or stock orders, get yours at our low factory direct wholesale price while supplies last!